Under the title “DEKTON. UNLIMITED.”, the campaign presents the perfect combination of Rafa Nadal, whose talent, strength and versatility on any surface has made him a world leader in sport, and Dekton®, a product made unique by its resistance, advanced technology, durability, versatility and beauty. Cantoria (Almería, Spain), 15 January 2015.- The ultracompact surface for the world of architecture and design, Dekton® by Cosentino, is launching its new advertising campaign together with Rafa Nadal as the face of the brand. The framework for the agreement signed between the multinational company and the tennis player from Majorca at the end of 2014, through which Cosentino has become a sponsor of the “Rafa Nadal Academy by Movistar” project, also includes the use of his image for advertising purposes. The campaign launch will take place simultaneously worldwide. Under the title “DEKTON. UNLIMITED.”, the campaign presents the perfect combination of Rafa Nadal, whose talent, strength and versatility on any surface have made him a world leader in sport, and Dekton®, a product made unique by its resistance, advanced technology, durability, versatility and beauty. 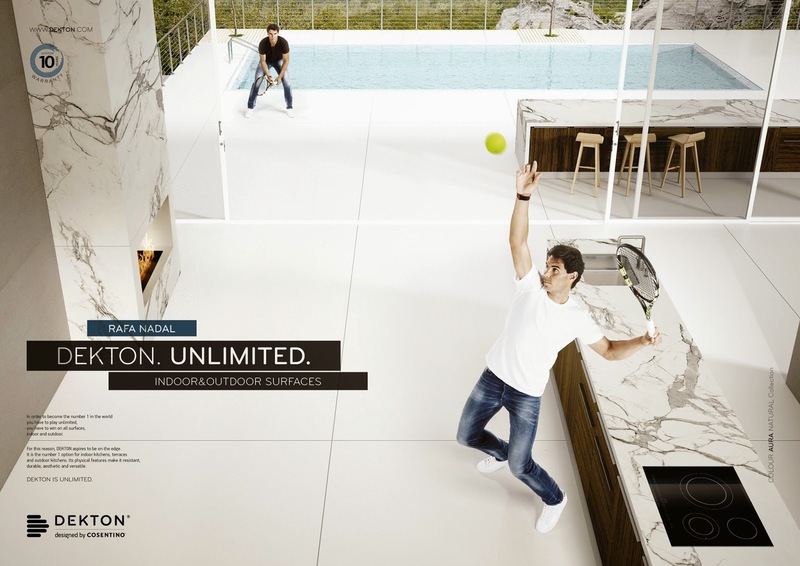 Dekton® and Nadal are unlimited. Just as a match is won stroke by stroke, forcefully, putting one's rivals and oneself to the test, Dekton® is subjected to unlimited force every day, with its uses and applications, technology and design being put to the test. The ultracompact Dekton® material forms the perfect partnership with designers and architects from all over the world for any interior or exterior project and with the highest guaranteed reliability. Its excellent properties, such as high mechanical resistance; good thermal shock resistance; very good colour stability; high resistance to scratching, staining, abrasion, UV rays and hydrolysis; and reduced water absorption means that Dekton® can be used on kitchen worktops and bathroom vanities, wall and floor treatments, furniture, façades and any other exterior surface. The new advertising campaign entirely reflects this versatility for applications that Dekton® offers, placing the tennis star in two large sets, one indoors and the other outdoors, which are completely covered with the new ultracompact surface in the shades of Aura (white with grey veining on worktops and walls), Zenith (matt white on interior and exterior floors) and Strato (grey on wall). The “Rafa Nadal Academy by Movistar” project, the tennis academy the sporting figure is soon to open in his home town of Manacor, Majorca, will also be an example of all the architectural and design possibilities Dekton® offers, as this material will be used on façades, floors and other surface treatments. According to Santiago Alfonso, Director of Marketing and Communications for Cosentino Group, “this new form of collaboration through which Rafa Nadal becomes the international image for Dekton®, our great contribution to the world of architecture and design, fills us with great pride. There are values that we undoubtedly share with Rafa, such as our daily effort, continuous innovation and the endless quest for leadership and success. We like to work with the best, and Rafa Nadal will help us make Dekton® a model of success for the world. 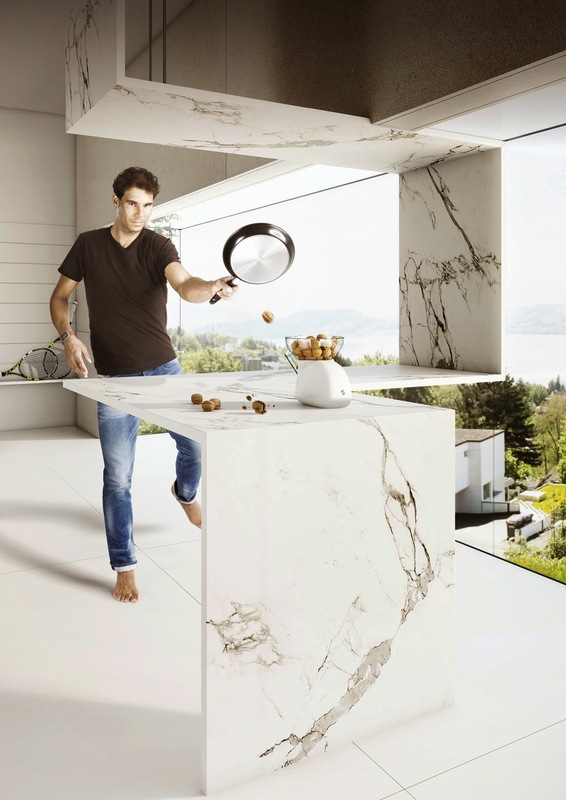 In 2015 the Spanish tennis player Rafa Nadal features worldwide Dekton® adversiting campaign. At the same time, thanks to Cosentino’s sponsorship of the project “Rafa Nadal Academy by Movistar” the tennis academy will include Dekton in diverse applications of the spectacular premises.